Our nonwoven fabric rolls are used in baby diapers, feminine hygiene and incontinence care products – in a wide range of different applications. Nonwovens are innovative, versatile and indispensable, and modern life would be quite literally impossible without them. Learn more in the following. Nonwovens are unique, high-tech, engineered fabrics made from fibres, that are used across a wide range of applications and products. Our spunbond/spunmelt nonwoven fabrics are mainly used in baby diapers, feminine hygiene products and incontinence products – in our industry also called: “disposable absorbent hygiene products”. These products make an important contribution to the quality of life of millions of people. Our fabrics are based on a spunbond/spunmelt technology. This is just one of the technologies when producing nonwovens. Depending on which technology platform is used, the nonwovens have specific characteristics used across a wide range of applications. Specific functions include: absorbency, liquid repellency, resilience, stretch, softness, strength, flame retardancy, washability, cushioning, filtering, bacterial barrier and sterility. Our nonwoven fabrics are key components in manufacturing of baby diapers, feminine hygiene and adult incontinence care products. Fabrics from our product lines can be used in different applications such as barrier leg cuff, backsheet, topsheet, core, laminates and closure systems. The dots show where our fabrics are used. Our four product categories; Loft, Dual, Elite and Comfort are designed to meet different needs. All four can be used in hygiene products where low basis weight, high performance and softness are essential, such as barrier leg cuff, backsheet, topsheet, core, laminates and closure systems. LOFT is adding a third dimension to our spunbond/spunmelt nonwoven fabric. By adding this new technology, we produce nonwoven fabrics with greater volume and a lofty structure for optimised cottony touch with an unprecedented level of softness. DUAL is a perfect solution providing supreme silky softness and enhanced drapeability. The base is bi-component spunbond technology with an optimal polyethylene/polypropylene ratio. ELITE is our spunbond/spunmelt nonwoven fabric with superior effects. The Elite range consists of Elite Soft, Elite Barrier and Elite Strength. It also includes Elite Sense and Elite Open Dot offering enhanced properties and distinctive visual appearance due to unique bonding patterns. COMFORT is our standard spunbond /spunmelt nonwoven fabric ensuring high performance at low basis weight. Innowo Print is our “steal-the-show” brand – with products where colours, scents and many other features can be added to the nonwovens in the printing process. Not only the nonwovens produced with technologies used by Fibertex Personal Care – but also other kinds of nonwoven produced with different nonwoven technologies used in the hygiene industry. The big idea at Innowo Print is to make an alternative to print on film, to improve the visual experience and to give the designer new possibilities and more space to play with. An alternative that should still be safe to use in products with direct skin contact such as sanitary napkins, baby diapers and adult incontinence care products. Our nonwoven fabrics are based on spunbond/spunmelt technology, which is an integrated one-step process – from raw material to fabric. It is a very technical and complex process to produce our wide range of nonwoven fabrics. Using our existing spunbond/spunmelt technology platform and extensive knowhow, we have just introduced an innovative technology – Loft Spunbond – enabling production of nonwovens with unparalleled level of softness. When properties like supreme silky softness and drapeability are requested, we use our bi-component spunbond technology. With this technology, the spunbond fibres consist of polypropylene and polyethylene in a core/sheath configuration, where the polyethylene sheath provides the enhanced softness and drapeability characteristics. Other patterns can be developed jointly upon request. Various botanicals are possible including: Aloe Vera, Olive Oil, Silk Protein, Vitamin E & Chamomile. A large assortment of our nonwovens comply with the requirements set forth by various expert associations. For products from Denmark, this includes the Nordic Swan Label, Oeko-Tex 100, the EU Ecolabel and The Blue Label/Asthma-Allergy Denmark. For products from Malaysia this includes Halal certifications. There is a long way from resin to nonwoven in a spunbond/spunmelt process and attention to detail in every link of the chain is required. PP/PE polymer resin and various additives are the raw materials used in the production of our nonwoven fabrics. The raw materials are melted/extruded and spun to form spunbond fibres and meltblown fibres in the respective fibre spinning beams. In the spunbond process, the raw materials pass through a die plate with holes spread over multiple adjacent rows. The fibres are stretched and deposited on a moving belt. Spunbond fibres typically have a diameter in the range of 13-17 µm/1.2-2.0 dtex. For the meltblown process, it passes through a die plate – with holes in a row. It results in a layer of thin filaments. These filaments are afterwards stretched while passing through a high velocity hot air stream. Meltblown fibres typically have a diameter in the range of 1-5µm. The spunbond fibres provide strength to the final web, whereas the thinner meltblown fibres provide barrier to the final web. The resulting product is often referred to as SMS or SMMS to signify that the spunbond(S) layers surround the meltblown(M) layers. The web is thermo-bonded using heated rollers to form a final nonwoven with optimum characteristics. For some products, hydrophilic or antistatic properties are desired. This is obtained by in-line application of surfactant. 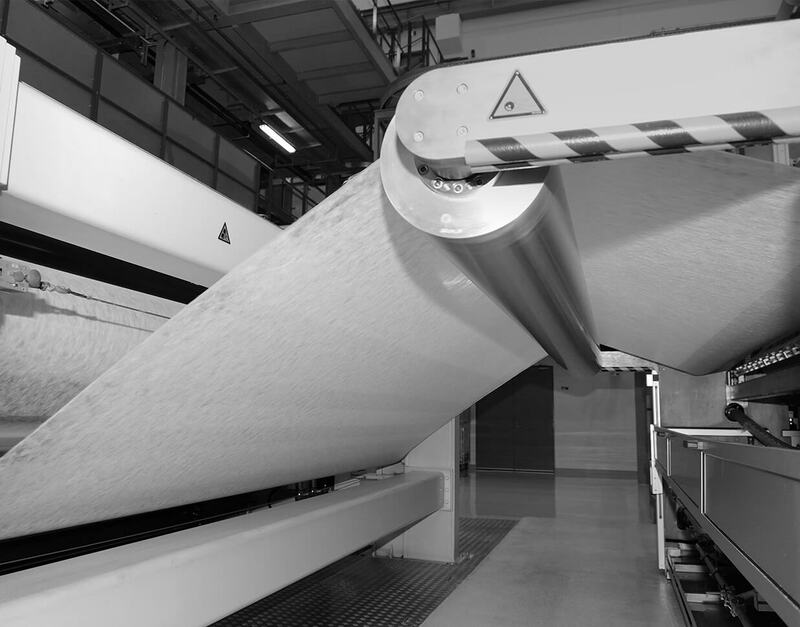 The spunbond/spunmelt fabric is scanned by cameras for quality control before being rolled onto shafts in large jumbo rolls, and subsequently cut into smaller rolls and packed according to customer requirements. Superior product quality is nothing but a good standard. It is reliability in every step of the process that is hard to come by. We have the right technology and machinery, but it is responsible and quality-conscious employees in every link of the value chain that ensures our customers the high quality they expect in our products and services. Continual improvements are necessary to exceed the expectations of our customers. We have one simple rule. Always strive to do better. We have formalised our working processes in our globally integrated Operational Guidelines. We have developed a system ensuring best in class quality assurance, product quality and quality logistics. The result is accountability and traceability through every step of the production process – from raw material to final delivery.